Daily transporation to Central City and Century Casino from various neighborhoods around Denver is available! Players can relax for the scenic journey with tickets for a casino shuttle from Ace Express Coaches and Ramblin' Express Casino Shuttle. Please visit either provider's site for information of pick up locations and schedules. Bus-riding players who ride either daily shuttle can get a $20 refund in Insta-Play against the cost of their ticket when they play 200 same-day base points at Century on their Player's Club card! 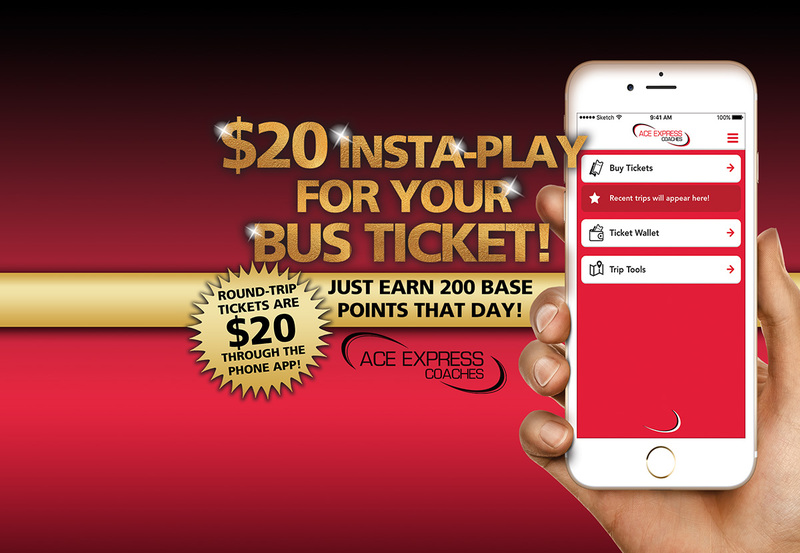 This benefits is available whether you have a paper ticket, or are using the Ace Express Casino Buss App. Round-trip shuttle tickets are just $20 with Ace Express through the app! Please visit the Player's Club or Cage after play with your physical or digital ticket to receive your Insta-Play!